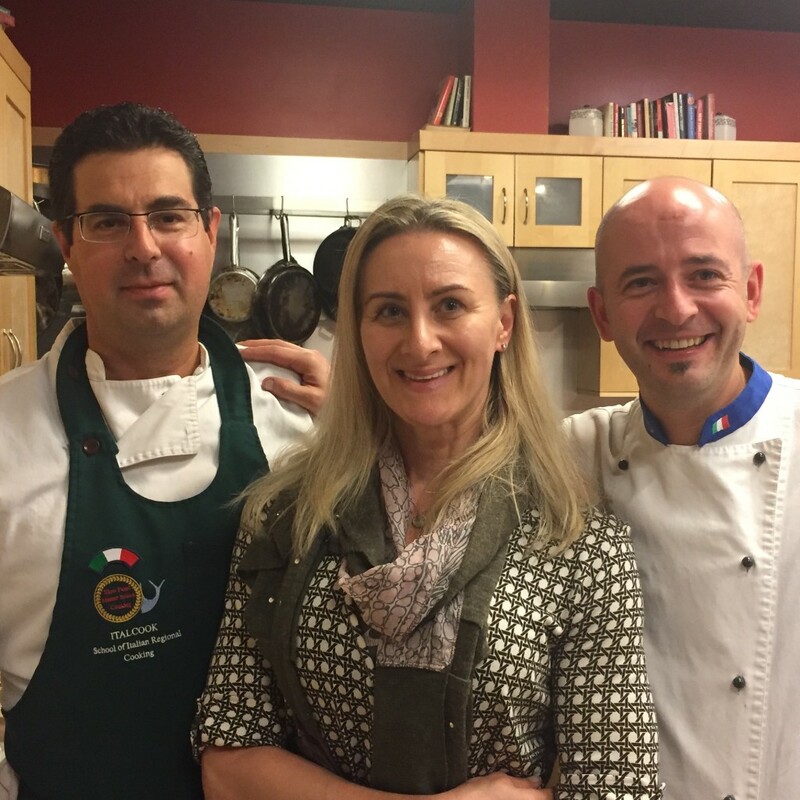 This week I had the privilege to attend a cooking class in my neighborhood. 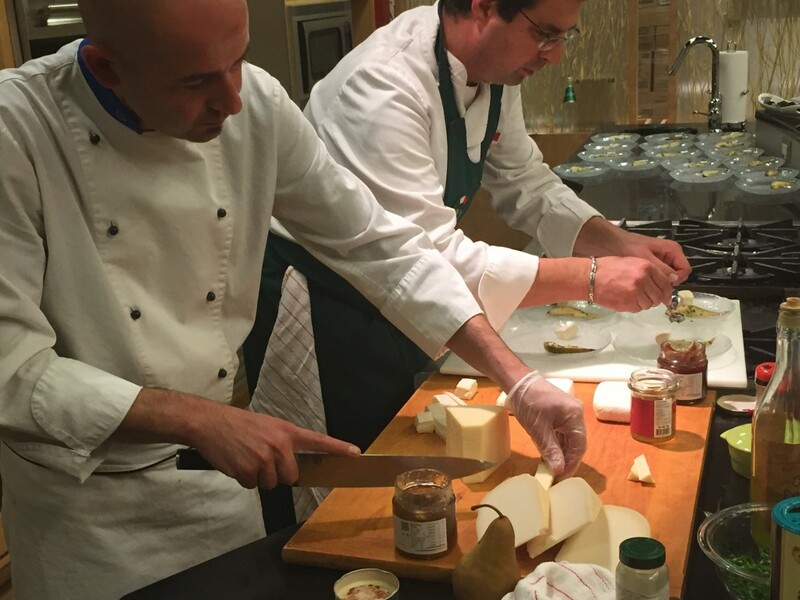 The theme of the event was Italian food specializing in pairing dishes with truffles. This was my first time tasting this type of mushroom, and I have to say it was delicious. 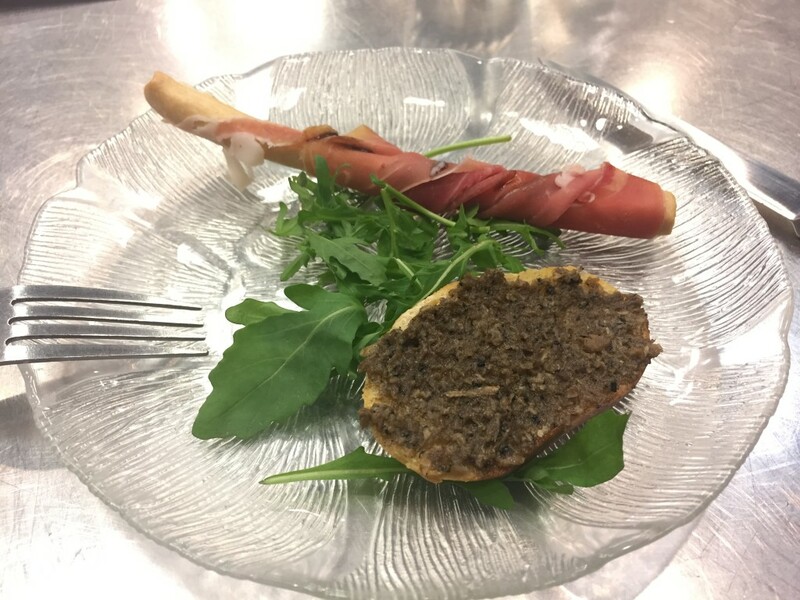 We started with a truffle butter bruschetta with a side of Italian bread stick wrapped in prosciutto. We then learned how to make Parmesan waffle. You will need grated reggiano and fry parsley leaves. Over a medium heat flame put the parmigiana in a non stick pan and let it melt, then take out of the pan and put the cheese on an upside down cup till it gets hard and ready to serve. 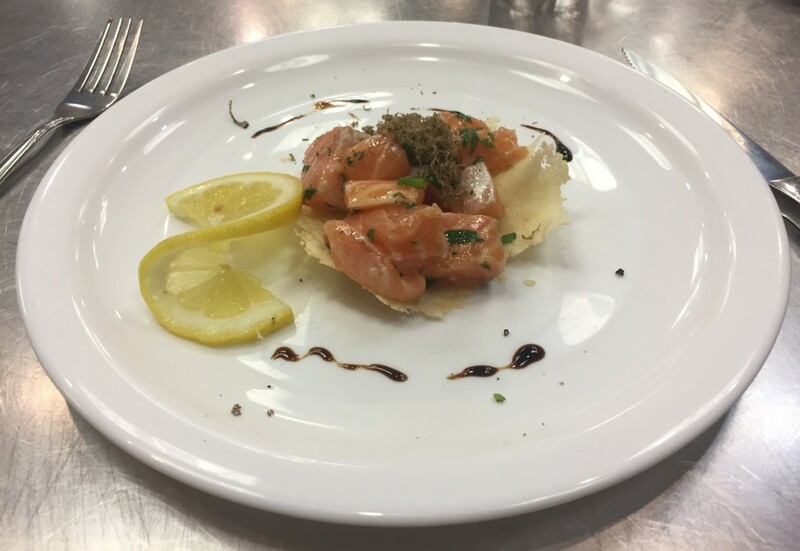 When the parmesan waffle is ready you can serve the salmon tartar. 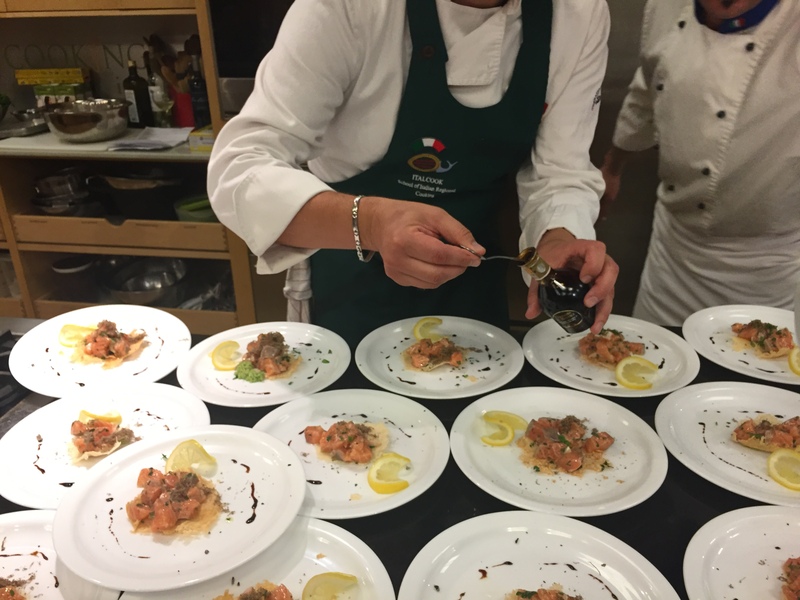 For the tartar you need fresh salmon filet (wild salmon is the best and has to be fresh), a touch of ginger, pinch of fresh chives, a pinch of Italian parsley, sea salt and pepper as needed. Cut the salmon into small cubes, add zest of lime, salt, and white pepper, add grated ginger, virgin olive oil, parsley, chives, mix and leave in the refrigerator for about 4 hours and serve when ready. Decorate with truffle balsamic and top with dry truffle shaved on top. 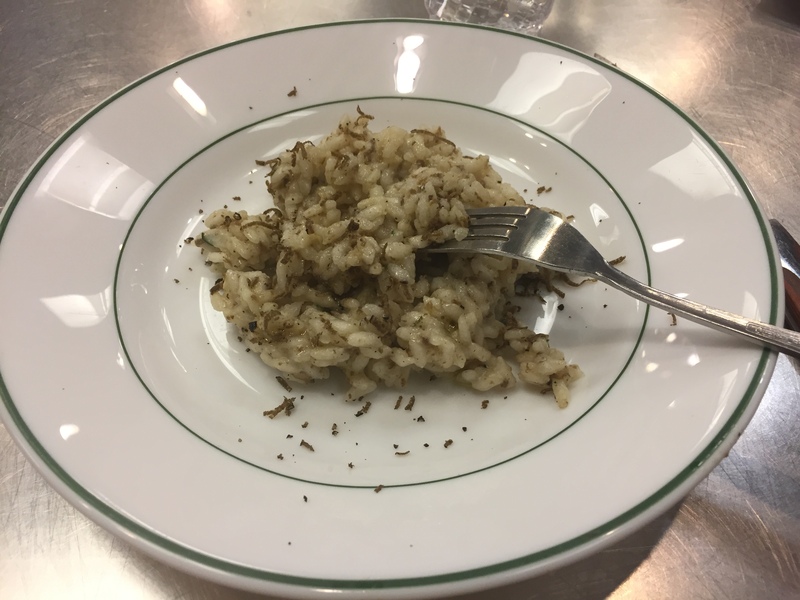 Next dish we made was risotto with fresh grated black truffle on top. 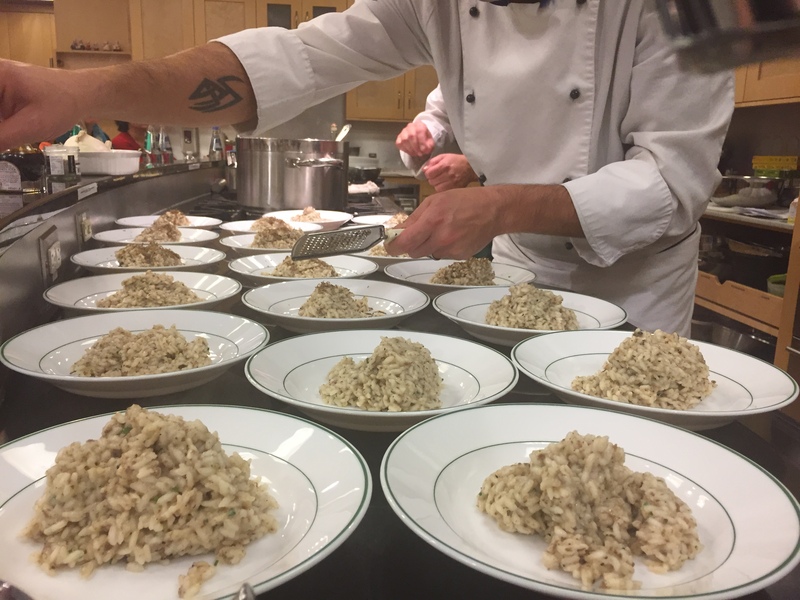 To make this risotto you need Carnaroli or Arborio riso, clove of garlic, spoon of olive oil, glass of white wine, bay leaf and vegetable stock. Cook the riso on a medium heat with olive oil, garlic, bay leaf. Add the stock and cook for another 18 minutes. 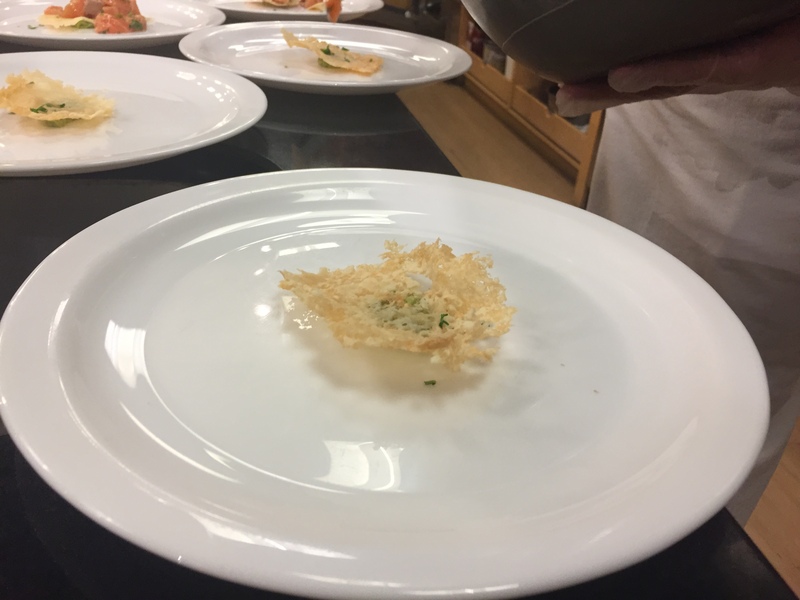 When it is cooked add the grated truffle, butter and parmesan cheese, garnish with more truffle and fresh rosemary before serving. 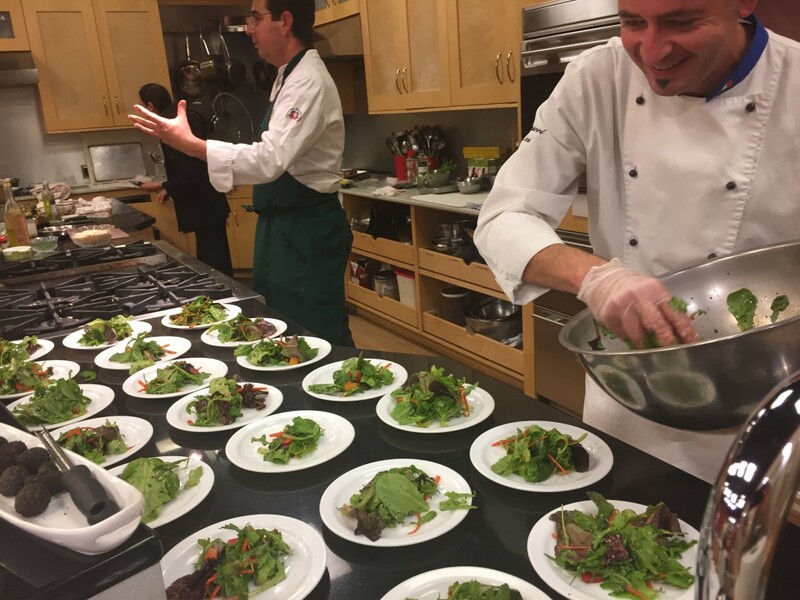 Our next dish was the butterfly rib eye over grilled potatoes and wild baby arugula salad in a balsamic truffle vinaigrette. 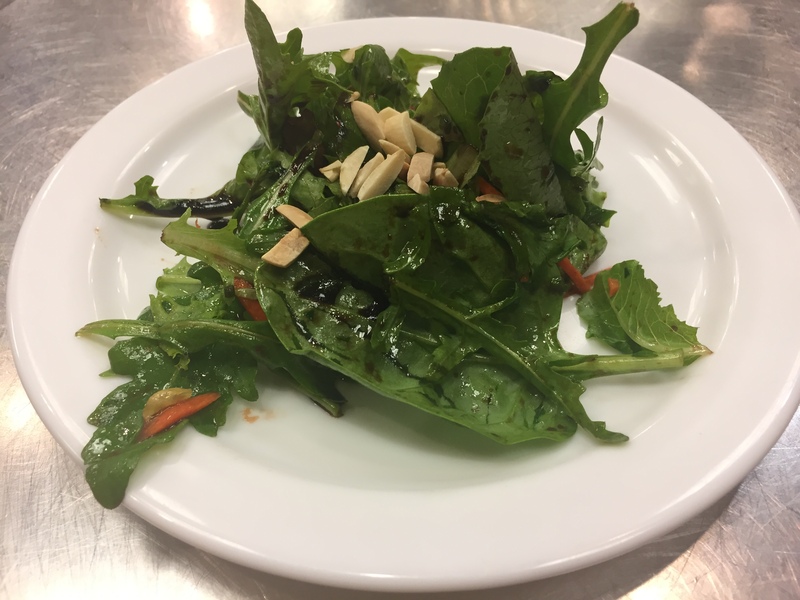 Wild baby arugula salad with shredded carrots, shaved almonds, and truffle dressing. 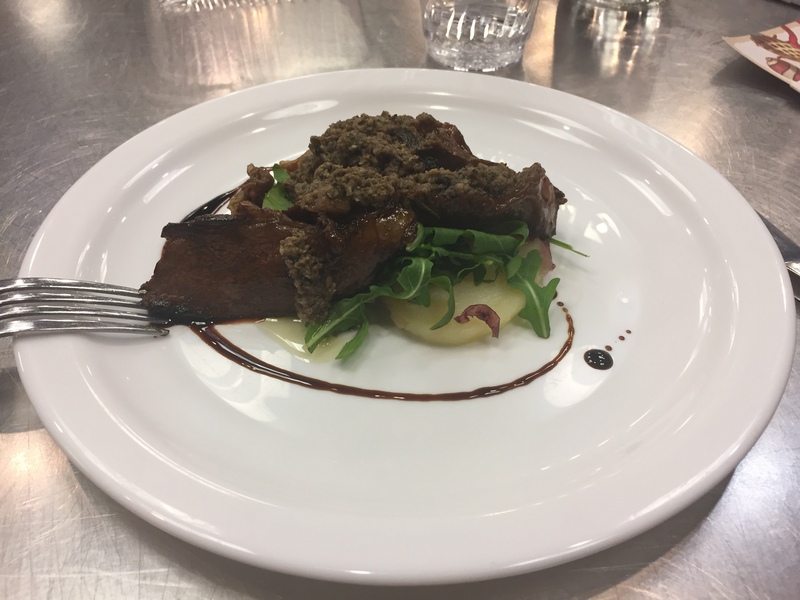 For this meat dish you will need a rib eye center cut, wild baby arugula, red potatoes, pinch of rosemary, spoon of truffle oil, 1/2 glass of balsamic, 3 spoons of olive oil, salt and pepper as needed. Put the balsamic vinegar in a pan, heat oil, add rosemary, salt and pepper. Add the meat and cook for about 3 minutes before serving on top of arugula salad and roasted potatoes. 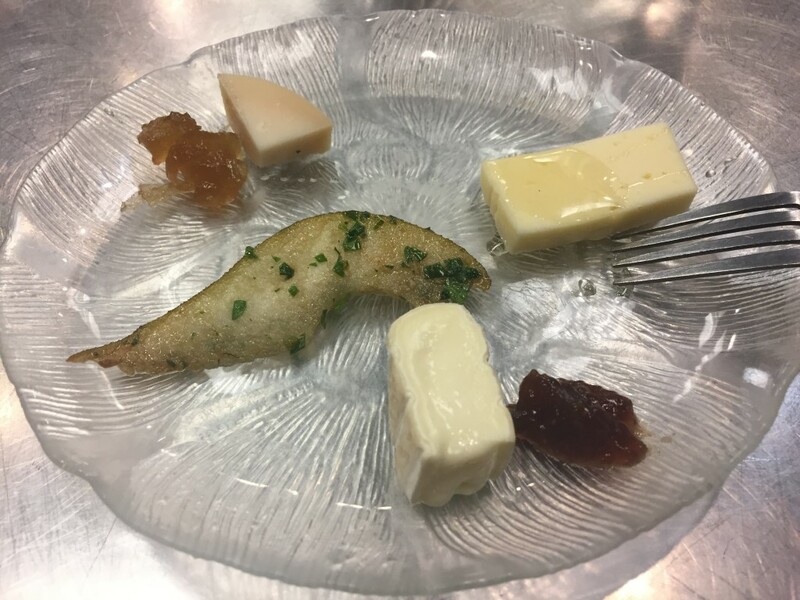 We completed the feast with a plate of poached pear and goat cheese, umbrian sweet pecorino cheese, robiola cheese with a touch of Sicilian organic fig jam, and truffle jam. Thank Chefs: Fabio and Luca for a great event!